(NaturalNews) That slick new smartphone you've been eyeing could end up damaging your brain or even giving you cancer later in life. This is according to data compiled for a powerful infographic on mobile phone use, which pins electromagnetic radiation emitted from mobile devices to nervous system damage, hemoglobin loss in blood cells, endocrine damage, digestive problems, elevated cholesterol levels, asthma, memory loss and mental confusion, headaches and fatigue, and cancerous tumors, among other conditions. Compiled by MobilePhone.co.in, the infographic explains how a shocking 5 billion people globally now use cell phones, which includes 303 million people living in the United States. Of this 5 billion, most keep their phones with them all throughout the day either in a pocket or purse, and nearly 70 percent keep their phones next to their heads on a nightstand while they sleep. What this means is that the vast majority of humanity is now being exposed to a constant stream of health-damaging electromagnetic radiation. Such health effects include the aforementioned conditions, and especially cancer and cancer-related conditions. The overall number of gliomas, for instance, or tumors of the brain or spine, has spiked dramatically since the advent of mobile phones. According to the data, some 10,000 new glioma cases are diagnosed every year just in the U.S., and heavy mobile phone users have been found to be 40 percent more likely than others to develop them. 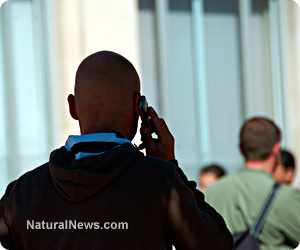 "Based on mixed epidemiological evidence on humans regarding an association between exposure to RF radiation from wireless phones and head cancers (glioma and acoustic neuroma), RF fields have been classified by the International Agency for Research on Cancer as possibly carcinogenic to humans (Group 2B)," admits the World Health Organization (WHO) on its website. Other conditions linked to mobile phone use include those aforementioned, as well as reduced immunity, decreased sensory and motor function, organ damage, obstructed sleep patterns, skin rashes, joint pain and muscle spasms. A study out of Israel's Tel Aviv University (TAU) that was published last summer also found that excessive mobile phone use causes general oxidative stress throughout the body, which in turn can lead to DNA damage and cancer. "[T]here is considerable oxidative stress on the tissue and glands which are close to the cell phone when in use," stated the TAU study's lead author Dr. Yaniv Hamzany about the findings. "The damage caused by oxidative stress is linked to cellular and genetic mutations which cause the development of tumours." This is particularly alarming for conditions related to the brain and nervous system, as these are the areas most exposed to mobile phone radiation. Not surprisingly, at least 50 percent of cell phone radiation is absorbed directly by the head and body during use, as cell phone users typically press their devices up against their heads while talking. Even worse is the fact that children with developing brains are most prone to damage by cell phone radiation, as their brains tend to absorb more of it on average than the brains of adults. The types of phones and the technologies that they use are also important factors, as smartphones using so-called "4G" or "LTE" network service are believed to be among the most damaging.